You are here: Home / Chapter 7 Bankruptcy / In Fear Of Filing For Bankruptcy? 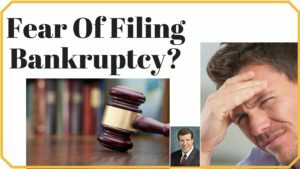 In Fear Of Filing For Bankruptcy? There is a very common concern or fear among those that are in debt with regard to filing for bankruptcy relief. They fear what they don’t know. They don’t know whether they are going to ever get credit again. They fear whether the entire world is going to find out about the bankruptcy filing and whether or not that filing is going to follow them for the rest of their lives. There is also a fear of failure. Some people look at bankruptcy as an absolute failure as a financial endeavor. Others however, look at bankruptcy as the fresh start for which it was really designed to be. Bankruptcy goes all the way back to biblical days. It was also made a part of the original Constitution for the United States which gave Congress the right to establish laws regarding bankruptcy. Once a person researches the topic and learns more about the ins and outs of bankruptcy, much of the fear can be eliminated. Filing a bankruptcy starts with meeting with a qualified bankruptcy attorney. Bankruptcy attorneys are scattered all over the United States in major metropolitan cities as well as in rural areas. There are two main chapters of the bankruptcy code. These two chapters are chapter 7 and Chapter 13. Chapter 7 is a fresh start. This is where someone who has very little in the way of assets and plenty in terms of debt can seek bankruptcy protection to eliminate such debt. There are some exceptions to the discharge of debt such as student loans, recent taxes, parking tickets, child support, and debts incurred by way of fraud. Chapter 13 is a reorganization which is a repayment plan of either all or a portion of one’s debt over a 3 to 5 year period. The amount that is paid back per month is dependent upon the person’s assets, liabilities, income and expenses. A person has to pay back at least what the creditors would get if a chapter 7 liquidation was to occur. In most cases, chapter 13 bankruptcy filings are confirmed at a 10% to 25% repayment plan. This means that if the debtor completes the repayment plan, the majority of the outstanding debt is eliminated forever. It is difficult to complete a chapter 13 in that one has to make payments for at least three years and sometimes up to five years. If you or someone you know is struggling financially and you’re just concerned about the fear of filing for bankruptcy, take advantage of the many resources that are available for free. You can watch numerous videos, read articles, check out blogs and speak with professionals regarding your situation for little or no money. If you decide to move forward with a bankruptcy case, there are requisite filing fees and pre-filing requirements that must be satisfied. At the time of this writing, the filing fee for chapter 7 is $335 and the filing fee for chapter 13 is $310. Each case requires the debtor to obtain a certificate for credit counseling prior to filing. This is a one hour session on the computer or over the telephone with a qualified counselor. Additionally, the debtor will have to provide either 1 to 4 years of federal tax returns and the most recent two months’ worth of pay advices. If you’re thinking of filing bankruptcy, a great place to start is DavidMSiegel.com. On that website you will find videos, articles, tips and tools to help you be successful in your filing. There is life after bankruptcy. Most people who file wish that they had done it sooner. Many waited too long to the point where they were garnished, bank account frozen and suffered endless sleepless nights until they realized that there was a solution provided for under federal law. For more information, contact my office at 847-520-8100.